Brown or grey, rounded body with stocky appearance, stumpy legs and a short tail, about 4 to 8.5″ in length. Voles, also called meadow mice or field mice, are chubby furry little rodents with small eyes and rounded hidden ears that thrive in prairie or woodland settings. They’re active day and night, don’t hibernate, and make tunnels with many burrow entrances. Vole females have 1-5 litters per year with an average of 5 babies in each litter. They’re capable of excessive damage to orchards, crops, and residential and rural landscapes. Voles are often confused with moles, but are actually quite different rodents. Plants, grass, seeds, bark, crops, insects, fruits, insects, and animal remains. 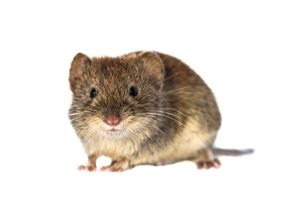 If you live in a rural setting, the most effective way to keep your home protected from vole invasions is to seal up any possible nook or cranny in the structure and foundation of the building to prevent them from accessing your living spaces. A baiting system installed on the exterior perimeter will control populations.